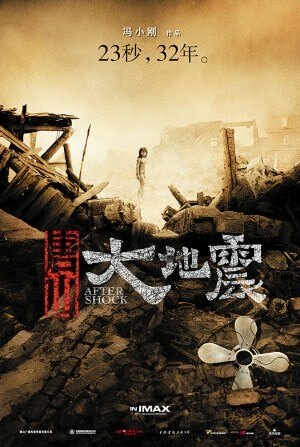 In the aftermath of the 1976 Tangshan earthquake, a rescue team informs Yuan Ni that her twins Da and Deng are trapped together under a slab of concrete. Lifting the slab in any way will kill one of her children - lifting it one way will save the daughter at the expense of her son; lifting it the other will save the son at the expense of her daughter. Heartbroken, she is forced to choose between her children, and finally decides to save the boy. Her decision, however, is overheard by her daughter, who tearfully whispers "Ma..." as the screen goes black. The mother clings to her daughter's body before being pulled away to take care of Da, "her one child who still lives." Later, in the midst of the rains following the earthquake, Deng wakes up in a sea of bodies, next to the body of her deceased father. The film is set in Sicily in 1940 during World War II just as Italy enters the war. Malena's husband, Nino Scordia, leaves to serve in the military. She learns that her husband has been killed. Malena tries to cope with her loss, as the town she has moved to tries to deal with this beautiful woman who gets the attention of all the local men, including the 12-year-old Renato. However, in spite of the gossip, she continues to be faithful to her husband. Renato becomes obsessed with Malena and starts fantasizing about her. Betty (Dalle) and Zorg (Anglade) are passionate lovers who live in a shack on the beach. He works as a handyman who does odd jobs to pay the bills. As the film begins, they have only been dating for a week and are in a very passionate stage of their relationship. Zorg narrates the story of their relationship via voiceover. He describes Betty as “like a flower with translucent antennae and a mauve plastic heart”. She yearns for a better life and quit her last job as a waitress because she was being sexually harassed by her boss.Zorg's boss asks him to paint the 500 shacks that populate the beach—a fact that he keeps from Betty who thinks they only have to do one. She attacks the project with enthusiasm that quickly turns to anger once she learns the actual number. In response, Betty covers the boss’s car with pink paint. During a nasty fight, Betty accidentally discovers a series of notebooks that contain a novel Zorg wrote years ago. She reads it and falls in love with him even more. She then makes it her mission in life to type every hand-written page and get it published. Betty's free spirited nature and devotion to Zorg develop into alarming obsession, aggression and destructiveness, and the film alternates between comic and tragic modes. The film opens in 1936, just before Joseph Stalin's Great Purge. Comdiv Sergei Kotov (Nikita Mikhalkov), an Old Bolshevik and decorated hero of the Russian Civil War, is enjoying life in his country dacha. Alongside him is his wife, Maroussia (Ingeborga Dapkūnaitė), their daughter, Nadia, and Maroussia's large and eccentric family of Chekhovian aristocrats. The charismatic Kotov, relaxed in his semi-retirement, is held in awe by all who surround him. Into this idyllic setting walks Mitya (Oleg Menshikov), an ex-nobleman and veteran of the anti-communist White Army. In addition, Mitya was also Maroussia's fiance before his sudden disappearance in 1923. He is joyfully embraced by the family and introduced to Nadia as "Uncle Mitya." However, it soon becomes clear that despite his humorous, friendly nature he has returned with a secret agenda. Mitya now works for the NKVD(secret police) and has arrived to arrest Colonel Kotov for involvement in a non-existent conspiracy. 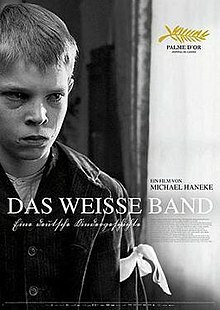 The setting is the fictitious Protestant village of Eichwald, Germany between July 1913 and August 1914, where the pastor, the doctor and the baron rule the roost over women, children and peasant farmers. The puritanical pastor leads confirmation classes and gives his pubescent children a guilty conscience over trivial offenses. He has them wear white ribbons as a reminder of the innocence and purity from which they have strayed. When his son confesses to impure touching, the pastor has the boy’s hands tied to the bed frame. The doctor, a widower, treats the village children kindly but sexually humiliates his housekeeper (the local midwife) and takes advantage of his teenage daughter at night. The baron, who is the lord of the manor, underwrites harvest festivities for the villagers, many of whom are the immigrant workers in his employ. He may summarily dismiss his twins' nanny Eva for no apparent reason yet defend the integrity of the farmer whose son has taken his revenge on the baron with the destruction of a field of cabbages. It is 1988, and Melo, a Uruguayan town on the Brazilian border, awaits the visit of Pope John Paul II. Numbers begin circulating: hundreds of people will come, no thousands say the media. To the poor citizens of Melo this means pilgrims in need of food and drink, paper flags, souvenirs, and commemorative medals. Brimming with enthusiasm, the locals hope not only for divine blessing but also a small share of material happiness. Petty smuggler Beto is certain that he’s found the best business idea of all: “The Pope’s Toilet”, where the thousands of pilgrims can find relief. Beto is thwarted by lack of funds and the local mobile customs enforcement officer. Ultimately the promised "60,000 to 200,000" Brazilians do not materialise. Apparently (in the film's postscript) only 400 Brazilians came, disproportionately served by 387 stalls for food and trinkets. The film makes it clear that the visit was a financial disaster to the town rather than bringing any wealth as promised. Beto has spent his daughter's college fund to no avail, but she forgives him, and at least he has a nice toilet.